I played a lot of computer games as kid growing up in the 1990s, and one of my favorites was SimCity 2000. I knew that the company that published it, Maxis, had been publicly traded, and nostalgia motivated me to look into its history. SEC filings and news articles show that Maxis had a short, star-crossed life as a public company. It went public in May 1995 as SimCity 2000 sales were cresting, and the stock tripled from its $16 IPO price within a few months. Unfortunately, it was all downhill from there. The games that Maxis released immediately after SimCity 2000 didn't match its success, and after several years of growing profits the company began to lose money. Two years after the IPO, Electronic Arts acquired Maxis for $11 per share. Before the acquisition the stock had traded as low as $7. Youtube has a video of Jeff Braun, Maxis' co-founder, giving an interesting presentation about the company's history. SimCity was the first game that Braun and his partner, Will Wright, made. When it was released in 1989, most computer games took after arcade games-- there were clear rules about how to win and lose, and winning meant achieving a specific objective or getting a high score. SimCity was radically different. There was no one way to win and no scoring. The game involved designing and building cities, and there were infinite ways that the player could do so. No one wanted it. [Will Wright] took it to a bunch of publishers and the consensus was, these publishers published games, and so they asked him "How do you win?" and he said "You can't win. It's like a city," and they said "Well, if you can't win it's not a game. We don't want it." I had a $4,000 computer and I loved games, and so I was playing all the games that were available, but they were all for teenage boys and [with] my reflexes I couldn't get past the first level, and I'm like, "How is it that games are being produced on the PC for people that can't afford them? And what about games for people that can? And I bet there's a market for games for people like me." True to his hunch, many of the people who bought SimCity were new to computer games. In its wake, Maxis released a bunch of other simulator games that were modest successes: SimEarth, SimAnt, SimLife, and SimFarm. 1994's SimCity 2000 was the proper successor to SimCity and an even bigger hit than the original. Maxis went public the following year. Around the same time, Wright began designing what would eventually become The Sims, which did for people what SimCity did for cities. There was a lot of opposition to The Sims within Maxis. The game's working title was Dollhouse, and many people couldn't see past the dumb name. Braun says that he and Wright opened a satellite office away from Maxis headquarters where they could develop the game in secret, without any criticism from the marketing department and the board of directors. Despite its rough beginning, The Sims ultimately became a runaway hit. For a while it was the best-selling game of all time. Like SimCity, it succeeded by departing from industry convention and creating a new market: Braun estimates that 70% of players were women. Unfortunately, it wasn't a runaway hit for Maxis: by the time it was released, Electronic Arts had acquired the company. Maxis didn't last long enough as an independent company to reap the rewards of its most successful idea. Arguably it never should have gone public, since its revenues were lumpy and its biggest products had no real precedent or predictability. The New York Times used to publish a weekly notice of new stock offerings. While researching Maxis, I found the notice for the week it went public. It was one of 29 companies that either IPOed or conducting a follow-on offering that week. While Maxis' performance as a public company was poor, it wasn't atypical. Many of the companies with contemporaneous offerings did even worse. Harmonic Lightwaves, Hardinge Brothers, and NGC Corp. all subsequently changed their names-- to Harmonic, Hardinge Inc., and Dynegy, respectively-- but their stock prices haven't changed. All trade at the same price as in 1995. Integrated Device Technology is lower today than in '95. Felcor is 60% lower, although it's paid significant dividends in the meantime. Borders, Boston Chicken, Computer Learning Centers, Number Nine Visual Technology, Uno Restaurants, and Videoserver all went bankrupt. Kmart, Borders' former parent and the offering shareholder in its IPO, also went bankrupt. Computer Learning Centers was a fraudulent for-profit college that David Einhorn mentioned in Fooling Some of the People All of the Time. Altron was acquired by Sanmina, which is down 40% since then. Altron was flat from May '95 until its acquisition. Nexgen was acquired by AMD, which is down 80%+ since then. Teltrend was acquired by Westell, which is down 80%+ since then. Adflex was acquired by Innovex, which went bankrupt. Uunet was acquired by Worldcom, which went bankrupt. All of these companies were acquired for stock, so long-term shareholders have shared in the acquirors' pain. APPS Dental was taken private two years after going public. Its annualized return in the interim was 9%, respectable but far less than what the major indices returned. ITI Technologies Inc. subsequently merged with a competitor. GE acquired the combined company in 2002, giving shareholders a 7% annualized return. Kenneth Cole Productions was taken private in 2012 after inflicting years of bad returns on its shareholders. Tekelec was taken private in 2011. Long-term shareholders who invested in its 1995 offering earned a 5% annualized return. Four of the offering companies were REITs that have since been acquired. I wasn't able to find accurate performance figures for them, but news releases suggest that their aggregate performance was fairly strong. They are men on a lifeboat in a sea of bad returns. A recent study finds that the median stock underperforms broad stock-market indices and that many stocks experience catastrophic, permanent losses. The performance of Maxis and its peers, while anecdotal, is a stark illustration of that. Auto lending: "keep your eyes on the exit door"
Stagflationary Mark recently linked to an interesting article from Bloomberg, Honda Warns Against ‘Stupid’ Auto Loans. What makes the article interesting is a couple of quotes it includes and the sense of deja vu they inspire. Automakers are increasingly selling vehicles with 84-month loans that reduce monthly payments while making it tougher to repay faster than cars lose value, John Mendel, Honda’s U.S. sales chief, said in an interview. The Tokyo-based company will avoid longer-term loans even as Nissan Motor Co. tries to supplant it as the fifth-biggest automaker in the U.S., he said. "You’re ringing the bell on a new-car sale, but that customer is saddled -- they’re stretched so thin," Mendel said at the North American International Auto Show last week. Extended-term loans are "stupid not just for us, but for the industry." "We believe that our customers have never been more stressed financially and, at the same time, have never been presented with more aggressive financing options for their vehicles." "We’ve seen this movie before, we know how it ends, and it’s not pretty," Webb told reporters at an event before last week’s show. "But I say that it has longer to run, and we have already paid the price of admission. So we might as well stay to the end. You just keep your eyes on the exit door." "As long as the music is playing, you've got to get up and dance... We're still dancing." Prince's quote coincided with an intensification of the financial crisis. Will Webb's quote coincide with a peak in auto lending? I'm not sure-- I wasn't around during the last auto-lending cycle, so I don't have a good sense of how much longer this one will last. But we've clearly entered the reckless phase of the cycle. To borrow Webb's metaphor, I think it will turn into a snuff movie for some of the more aggressive lenders. Merchants of Grain is a history of the international grain trade, with an emphasis on the five companies that dominated it during the 1970s: Andre, Bunge, Cargill, Continental, and Louis-Dreyfus. Archer Daniels Midland figures much less prominently, probably because their business was concentrated in the United States. The book begins in ancient times: Classical Greece wasn't self-sufficient in food production, and this was the genesis of the first global grain trade. Athens imported grain from Egypt and the Near East through a proto-modern system of shipowners, bankers, and merchants. Likewise, the Roman Empire required large imports of Egyptian and North African grain to feed its capital city. Grain trading was much less prominent in medieval and renaissance Europe, most of which didn't enjoy the cheap seaborne transportation that Greece and Rome had enjoyed. In the 17th century, only 3% of Europe's wheat harvest crossed national borders. The modern grain trade began in the 19th century, with the Industrial Revolution and the mass migration of people to cities. One of the major trade routes that emerged transported Russian wheat from Odessa to various Western European ports. Greek shippers dominated this route in its early decades, but they were eventually muscled out by British and French traders who enjoyed support from their governments and domestic banks. Later the British grain traders themselves faded from prominence, in part because British millers began to contract grain purchases directly. Even as harvests and shipments grew exponentially, the industry had many losers. The United States became a major grain exporter when the Great Plains were settled. An American milling industry sprang up, concentrated in Minneapolis, and the grain trade emerged alongside it. Merchants of Grain suggests that grain processing and trading was more profitable in the past than it is today. Minneapolis's two major grain terminals had 30-40% returns on equity in the 1880s. (The book implies that the high ROEs were a result of anti-competitive practices that would be illegal today.) In 1920, the Federal Trade Commission investigated the trading companies that exported American grain and found that they had an aggregate return on assets of 22% and an aggregate return on equity of more than 40%. The high returns ended during the Great Depression, which put many grain traders out of business, but the ones who survived participated in another boom after World War II. The book states that "Only a few million tons of grain a year moved down the Mississippi River immediately after World War II. By 1975, nearly 50 million tons of corn, soybeans, and wheat traveled down this river artery." • Farmers could make more money selling grain than feeding their livestock, so they slaughtered them at abnormally high rates. This led to large glut of pork at first, then a shortage and surging prices. • Commodities trading exploded. The large grain traders conducted most of their business through a private grain exchange because the public commodities exchanges were too small to handle all of their business. Nonetheless, "A seat on the Chicago Board of Trade, which had gone for $20,000 in 1960, cost more than $150,000 in 1976, exceeding the price of a seat on the New York Stock Exchange." • Commodities trading profits exploded as well. "In 1971-72, Cargill's earnings after tax were $19.4 million. The next fiscal year they jumped to $150 million. Worldwide the company earned $886 million after taxes between 1970 and 1976." In retrospect, this was a once-in-a-century boom in an otherwise-mediocre industry. The book mentions that the grain traders had poor returns in the 1960s, prompting them to diversify into shipping, meatpacking, and oil. Returns worsened again in the late '70s, and there were several blowups. A rapidly-growing grain trader called Cook Industries went out of business after shorting soybeans while the Hunt Brothers tried to corner the market, and Continental short-sold the Soviet Union a large quantity of grain right before prices surged. Poor returns and blowups seem to have become the norm since then. Andre went bankrupt in 2001 after a rogue trader lost $200mm on soybeans. It had lost money for a couple of years before that, and the rogue-trading loss pushed it over the edge. Continental, which processed a quarter of America's grain during the 1970s, exited the industry in 1998 and is now exclusively a meatpacker. Wheat varies a lot in protein content, and high-protein and low-protein wheat are used to bake different things. Typically high-protein wheat sells at a premium. Drought increases protein content, and Western Canada tends to produce higher-protein wheat than the Great Plains. In the late 1800s, Russian wheat developed a reputation for being low-quality: exporters tried to increase their profits by diluting the wheat with rocks, soil, etc. Some British importers responded by investing in machinery that would clean the grain. It reminds me of oil refineries that are optimized to process high-sulfur oil. California experienced an agricultural boom after the gold rush ended. For a couple decades it was a major grain exporter to Britain until British colonies-- particularly India-- displaced it in the 1880s. The book mentions numerous grain traders who went bust after initially making big profits, including Jospeh Leiter, Isaac Friedlander, Mark Najar, and Ned Cook. Friedlander went broke a few times. I've been meaning to write a bearish article about Horesehead Holding (ZINC) for a while. Unfortunately the stock is down 11% over the past couple of days and trades at its 52-week low, so this post is less timely than I'd hoped it would be. I have no idea how the stock will perform over the next few months. It may bounce back from its recent sell-off. I'm skeptical of the company's long-term prospects, though, and think it has underappreciated risks. Steelmakers use zinc to galvanize many kinds of steel, and the galvanization process generates zinc dust as a byproduct. ZINC has a unique business model: it removes this dust from steel mills, processes it into usable zinc, and then sells it back to steelmakers for the next round of galvanization. The company recently built a new refinery that it expects to increase its capacity and lower its operating costs once it's fully operational. • ZINC will be a low-cost producer after the new refinery scales up. • The fundamentals for zinc-- the metal, not the company-- are good. • ZINC has two high-quality niche divisions that complement its main business. There's a writeup on Value Investors Club recommending the stock. It's well-written and mentions all of the things that I consider major risks, although obviously I disagree about their likelihood. • ZINC's historical cash flow is negative. That's a result of its building the new refinery, which has experienced operational delays and necessitated three dilutive securities offerings, but its historical returns were unimpressive even before that. As of now, the bull case for ZINC rests on projections of how much it will earn once the refinery reaches capacity, but the company's track record gives reasons for skepticism. • ZINC borrowed a lot of money to build the refinery, so while this will lower the company's operating costs, it will simultaneously raise its financing costs. I don't think this was a good trade: if operating costs make a refiner unprofitable, the refinery can be idled. If financing costs make it unprofitable, the interest payments can't be put on standby. ZINC's predecessor company went bankrupt in 2002, during the last commodities bust. • Zinc prices are above their historical norm. The VIC writeup uses the average zinc price from 2004-14 in its projections, but the commodity bubble started around 2004, so the past decade isn't representative of normal zinc prices. They were much lower, on average, during the 1990s. In 1995, a typical year, they were around 65-70 cents per pound in today's prices compared to 96c right now. In 2001-02, zinc got down to 35c, or 45c in today's prices. By comparison, the VIC writeup suggests 60c as ZINC's cash-flow breakeven point after debt service. • The writeup states that the new refinery will make ZINC "a global low cost producer," but I don't think that's the case. The writeup suggests that ZINC's EBITDA breakeven will be 42c per pound, but many zinc mines have lower cash costs. A few have negative cash costs after byproducts. ZINC does have lower transportation costs, however, since its facilities are situated near it customers' facilities, whereas the U.S. has to import most of the mined zinc that it consumes. • Several large zinc mines will close over the next few years, and many investors expect this to result in higher prices. I'm skeptical because the mine closures have been anticipated for a while, so I think the market has had time to price them in. Ed Seykota's Market Wizards interview describes a similar scenario early in his career: the US Treasury was about to finish selling down its silver holdings, and Seykota went long silver futures because he expected the price to rise once the Treasury was done. Instead the price fell, giving him "a very stunning education about the way markets discount news." • Most zinc-bearing mines are polymetallic: they might produce gold, silver and zinc together, or copper, zinc and molybdenum, or zinc and lead, or some other combination of metals. Zinc is a byproduct for many of these mines, so the zinc price has relatively little influence over their production decisions. This limits the market's ability to adjust supply when zinc prices fall and can lead to protracted gluts. A couple of mines that Teck Resources owns, Red Dog and Antamina, illustrate this. Red Dog is one of the world's three largest zinc mines. Antamina produces copper, zinc, and molybdenum, and its copper output is worth five times as much as its zinc output. Although zinc is a fairly minor byproduct for Antamina, it produced almost half as much as Red Dog in 2013. • ZINC's niche divisions, Zochem and INMETCO, may produce good long-term returns on invested capital, but they're cyclical. ZINC bought INMETCO for a song in 2009 in part because the Global Financal Crisis had temporarily destroyed its earnings. • ZINC reminds me of Fortress Paper, a one-time value favorite that's down 95% over the past few years. Like Fortress, ZINC has a couple of niche divisions that are hidden gems. Like Fortress, ZINC is responding to a promising market opportunity by bringing new capacity online. And like Fortress, ZINC has borrowed a lot of money, done a dilutive stock offering, and experienced operational problems while developing that capacity. • Many value investors are interested in ZINC because Mohnish Pabrai is the company's largest shareholder. Pabrai has good long-term returns, but he's also had his share of losing investments, so I hope that investors aren't outsourcing their due diligence to him. I spent this morning clearing out my bookmarks folder and found a bunch of old articles that are worth sharing. Here they are, organized by topic. I did a lot of work on JetBlue when they were starting out and went public (and the stock was flying high), and while I loved the company, I fortunately avoided the stock after an old industry veteran CEO warned me that a major reason for the high margins and returns on capital that JetBlue was showing were because it was a small, rapidly growing company. Maintenance is a HUGE expense and every plane in the world is on a maintenance schedule that calls for certain (very expensive) things after a certain number of flight hours and/or takeoffs and landings: an engine "tune-up" after 500 hours, and engine overhaul after 2,500 hours, replace the tires after every 100 landings, etc. (I'm making up the numbers, but you get the idea). For a small carrier that is getting deliveries of new planes every month, you can see how maintenance expense as a percentage of revenues will be very small -- I recall for JetBlue it was something like 1/3 the amount of mature carriers (2% of revenues vs. 6%) -- because when you buy a brand new plane, there's ZERO maintenance cost for a while, and then it ramps up over the first few years. But over time, as the airlines grows and new planes as a percentage of the carrier's fleet shrink, this advantage goes away and the upstart ends up with the SAME maintenance costs as everyone else (roughly speaking; carriers that have shorter segments and therefore more takeoffs and landings will have higher maintenance costs, all else being equal; carriers that fly only one type of plane (like Spirit) will have lower costs). Tilson estimates that normalizing maintenance costs would reduce Spirit's earnings by 15-20%. It seems like this dynamic would contribute to airline overcapacity, although to what extent I don't know. Matt Joass reviews Dragon’s Tail: The Lucky Country After the China Boom. His review discusses China's development model, its contribution to Australia's two decades of nearly-uninterrupted growth, and why neither is sustainable. [But] Where I'm most concerned about the banks today is in their funding... For as much as 90% of the industry's deposits, there are no structural barriers to leaving. Deposits are completely liquid. They don't have a six-month, a one-month, or a two-week maturity, let alone an overnight one. Contractually, they're available now. A business professor describes how Sardar Bigliar has entrenched himself at Bigliar Holdings in order to transfer as much wealth as possible from the company's outside shareholders to himself. Institutional Investor interviews Christopher and Richard Chandler, a pair of brothers from New Zealand who turned a $10mm family fortune into several billion dollars by investing in emerging markets. Notably, they accomplished this without earning any fees managing outside money. The interview describes their investing process and some of their most important investments. In 2007, a year after the interview, the brothers split their assets and began investing separately. My sense is that their subsequent returns have been poor. The interview says they were lowering their standards prior to the financial crisis, and emerging markets have performed badly since it ended. Richard Chandler also lost money in Sino-Forest. Nonetheless, their earlier record is impressive. Reuters describes how Chinese speculators are hoarding large amounts of copper, including "thousands of tonnes of copper cathode... turning green after years of exposure to the elements." According to one bank analyst, "All we know is that we are selling a tremendous amount of metal to China for reasons that don't appear to be logical." While first-movers in the core should fully benefit from inflating asset bubbles, their imitators in the periphery should be left 'holding the bag' when the bubbles collapse. In contrast, isolates have no way of knowing about core managers' investment positions, and consequently no means of imitating these positions. Peripheral funds seem to be an example of a little knowledge being a dangerous thing. Phil Greenspun reviews Start-Up Nation: The Story of Israel's Economic Miracle, stating that "The book meets all of the rigorous standards of business bestsellers, which is to say that it is mostly anecdotes." Greenspun argues that Israel's success in producing tech start-ups is the result of several specific factors, including mass immigration of Russian Jews to Israel after the Soviet Union collapsed. According to the researchers, "The U.S. ratio of household debt to disposable personal income peaked at about 130% in 2007. 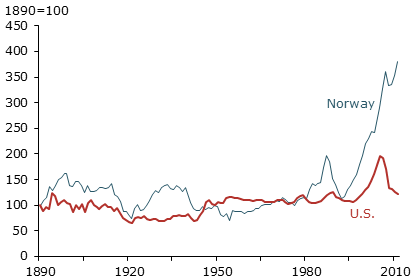 The leverage ratio in Norway has risen dramatically over the past decade and currently stands at around 210%." James Tisch gives a speech at Columbia discussing several of his biggest investments. Tisch is like the anti-Buffett: his investment strategy is to buy mediocre assets at extremely depressed valuations. I think it's admirable for people to try to articulate their philosophy on life, but they should be aware that being very successful at business or politics in no way implies they can explain that success... I don't presume that having a redundant and trite Weltanschauung means these people aren't good investors or managers, merely, their ability to pontificate on a general life-strategy is not the core of their alpha. A biography of Karl Wittgenstein, father of Ludwig and one of Europe's richest men at turn of the century. Starting with a small steel mill, he eventually monopolized steel production in Austra-Hungary. Wittgenstein was Europe's answer to America's robber barons: he introduced a lot of innovative business practices, but his big break came from cheating a business rival. Fortune profiles Jonathan Bush, cousin of Dubya and CEO of AthenaHealth. The profile reads like a parody of the tech/startup bubble. I know nothing about AthenaHealth, but the article convinced me that it's worth looking at as a short. The Sydney Morning Herald looks at the role investors play in Australia's housing bubble. Many of Australia's housing speculators have negative cash flow but expect to offset that with capital gains. Further appreciation may not be forthcoming, however, because "Australia has the world's most overvalued housing market on a price-to-income basis after Belgium." Chris Nichols argues that banks will be worth more in the future because the FDIC is approving almost no new banking charters, reinforcing "one of the greatest barriers to entry that any industry enjoys." He expects this to lead to rising profits, rising bank valuations, and industry consolidation. I'm more skeptical because I think that macro forces can overwhelm industry-specific developments. E.g. if there's another financial crisis, I would expect bank stocks to plunge regardless of the sector's long-term direction. But it's something to keep an eye on. When you decide to build, you inherently become a buyer. You have the distribution channel, and you need a stream of new drugs to keep than channel full, otherwise your business dies. You buy a company for $10. It pays you back $50 over the next few years. So now you have $40 to spend. And you must spend it. In a few years the original product expires and you need to fill that channel. This is the current state of the biotech market. Large cap biotech bought companies for $10, and made a LOT of money. Problem is there are no more $10 companies. They all cost $40 now. I don’t think I have to go any farther. You know how this ends. The lucky ones get sold for $40, but the payback is still only $50, so next time around, the buyer only has $10 to spend. [Citigroup executive Georgina Baker] acknowledged under examination by Mercuria’s lawyer that she did business with Mr. Chen’s company for eight years at Standard Bank before joining Citi, that she attended a party and numerous dinners where he was present, and received a $15,000 watch from him for her birthday in 2012. However, she denied knowing that Mr. Chen was the source of Mercuria’s metal. The Wall Street Journal writes that many companies that have recently gone public are reporting "adjusted" earnings which may overstate their true profits. They include Zoe’s Kitchen, which "is serving up profits—but only after leaving some of its expenses off the menu." UndervaluedJapan describes Japan's economy during the 1920s and '30s in a series of three posts: The Showa Recession, The Showa Depression, and Did Korekiyo Takahashi Save Japan? This is the most compelling thing I've read recently, in that it's both relevant to today's markets (there are several parallels between the Japanese economy then and now) and unfamiliar to most investors (I've never seen it discussed in the financial media before). Ben Hunt of Salient Partners argues that oil's supply/demand fundamentals are much better than media narratives suggest they are. Hunt writes that "today’s dominant Narrative [is] that OPEC is broken and oil is now in free fall.... [but] November OPEC production was down 390,000 bbls/day from October and down 510,000 bbls/day from September." Stagflationary Mark revisits some of Jim Rogers' recommendations from the past few years. They include buying silver at its 2011 high (three times the current price) and buying Russian stocks in late 2012 (nearly twice the current price). Notably, Rogers became a Russia bull after years of being bearish while Russian stocks rose. Vienna Capitalist bought Russian securities during the recent ruble panic and explains his reasons for doing so. He makes a persuasive case that Russia's national balance sheet is much stronger now than it was in 1998. Sometimes I feel like a broken record saying investors should be aware of the risk in their portfolios. But when I read message board threads where posters are saying they are disgusted by a 10% return I start to wonder what sort of environment we're in. Others have done 25% annually and speak like they're just average and feel they can do better. There are not many investors who've compounded capital at 25%+ or higher for decades. Oddball also mentions that investment themes have a finite life. Or as Credit Bubble Stocks writes, "There are no evergreen investment strategies that will always work." Robert Shiller says that Treasury bonds don't fit the classic definition of a bubble.